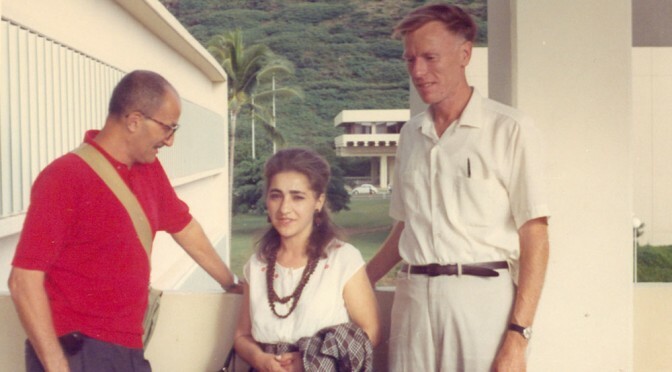 As department chair during the academic year 1968-1969, Paul Halmos (left) hired a small generation of new faculty members, the last of whom retired in 2015. The Mathematics Department of the University of Hawaii (now the University of Hawaii at Manoa) was founded in 1954. Before 1954 mathematics was part of the School of Engineering under the chairmanship of Wilfred "Jasper" Holmes (who helped crack the Imperial Japanese ciphers during World War II). The department began with only 6 members. One was the wife of the Dean of Faculty. Not all were mathematicians; one, a Navy buddy of Holmes, was an engineer from Pearl Harbor. Christopher Gregory was the first department chairman. An archived department web site from 2011 is available at math-hawaii-edu.appspot.com. 2010 Chair means Chair for the 2010-2011 academic year; Summer Chair means Summer Acting Chair.